The Rosicrucian Egyptian Museum & Planetarium in San Jose brings a little bit of ancient Egypt to the San Francisco Bay Area. 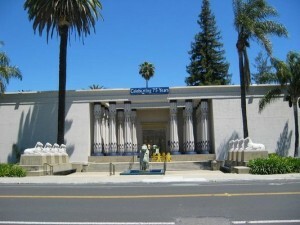 This museum “houses the largest collection of Egyptian artifacts, on exhibit in the western United States — including objects from pre dynastic times through Egypt’s early Islamic era”, including several mummies, all located in a building “Architecturally inspired by the Temple of Amon at Karnak”. Set in a beautiful ‘Peace Garden’ the museum has a great collection of Egyptian artifacts, and even a replica of a rock-cut tomb. Not quite the same as visiting the valley of the Kings and Queens, but next best thing!! Displays are well marked and give a good representation of ancient Egyptian life and religion. Well worth a few hours!